It’s a well-known problem in Westborough that needed some clever thinking to solve. 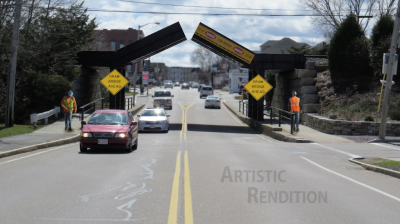 After years of frustration and traffic snarl-ups resulting from tractor-trailers hitting the low clearance East Main Street bridge, town officials have finally reached an agreement train transportation company CSX that should resolve the situation. That solution? A drawbridge. Most people are familiar with drawbridges over waterways, which are retracted to allow passage for ships that are too large. This new bridge will be designed in a similar fashion so it can be easily raised for tractor trailers that are too tall to fit safely underneath it. The town will be utilizing a drawbridge firm from the Island of Sodor, which boasts some of the most well-known experts in the field of train depots, stations and bridges. According to a statement from the bridge consultants, the town will continue to use the Overheight Vehicle Sensor System [show vehicle sensor image] – the laser warning system recently installed that measures a truck’s height before it has a chance to hit the bridge. In this case, that sensor will trigger the drawbridge. Police Chief Alan Gordon said his department regularly receives reports of trucks either striking the bridge, or approaching the bridge and coming to a halt when they realize they may not clear the underpass. The traffic backup and the associated costs can be significant, which is why the Chief was thrilled with this proposed solution. The agreement was signed on April 1st 2016 and work is expected to begin at some point soon and may be completed sometime thereafter. You had me for a few moments there – I thought that seemed like a wonderful idea, and why hadn’t someone thought of it before! If we can’ t get the drawbridge, on to the next idea: the Rotary Bypass Tunnel! I’m guessing this is an April Fool’s joke judging by the unfathomable mechanical explanation. But if you really have a low bridge problem, why not let the warning hang down on a moveable flap with a huge warning written on it the way they do on Storrow Dr. in Boston? People continue to hit the bridge, but I think it does stop some folks. A bypass tunnel would be a great way to open Main Street to pedestrian traffic changing the nature of down town. I suspect the cost might be too high for the town to bear though. I would love to see downtown as a center for music and entertainment to increase the stature if Westborough as a place to visit for tourists and a place to live for us.